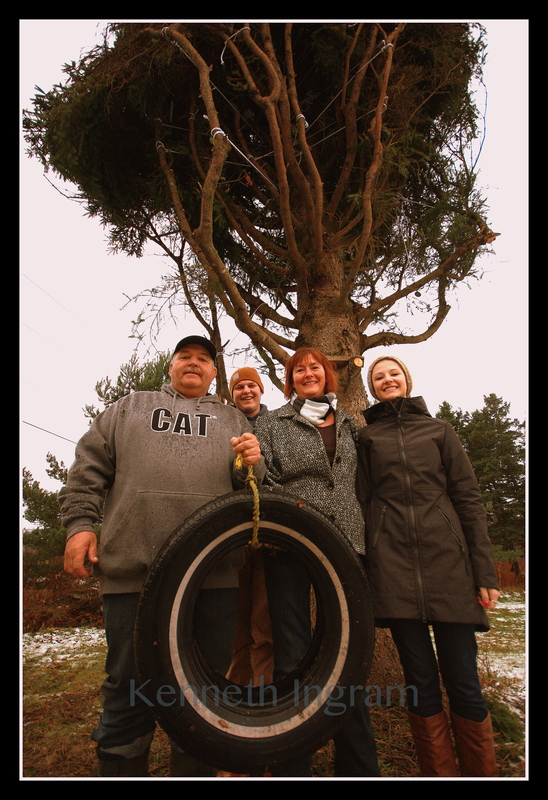 The Christmas tree that will soon stand in Boston Common, an annual gift from the City of Halifax, was cut from a backyard in northern Nova Scotia, where, for the past 17 years, the only decoration that hung on it was an old black tire swing for the kids. “They’re all grown up now,” said John MacPherson, who raised two children with his wife, Ethel Ann MacPherson, in a small county of Nova Scotia called Antigonish. The MacPherson Family of Purlbrook, Antigonish. The family also has a distant connection to the tree’s next home: John MacPherson’s mother, Kay, has extended family in Boston, and she hopes some of them will be able to attend the official tree-lighting ceremony to be held Dec. 4. This year’s tree is dedicated to the memory of Thomas M. Menino, Boston’s longest serving mayor who died in October. The MacPhersons agreed to donate the 48-year-old spruce after staff from the provincial government knocked on their door a few months ago, asking if they’d consider sending the tree as a gift to Boston. “I’m right on one of the main highways,” John MacPherson said, figuring the government official must have caught a glimpse of the tree while driving by one day. The MacPhersons’ tree, which naturally has its own Facebook page and Twitter handle called @TreeforBoston,was chosen this year because it was big and healthy, says Tim Whynot, an official at the Department of Natural Resources in Nova Scotia who coordinates the Boston Christmas Tree project. Its journey south will be the longest yet, more than 700 miles, in the long tradition between Boston and Halifax. Antigonish, a small, northern college town, is farther from Boston than any previous year’s tree. It’s the home of St. Francis Xavier University, which claims that its university “X-Ring” is the third most recognizable ring in the world – after the Super Bowl and papal rings. This is the 43d consecutive year that Halifax has sent a Christmas tree to Boston as a token of thanks for acts of generosity in the midst of tragedy nearly 100 years ago. Early in the morning of Dec. 6, 1917, a fully loaded ammunition ship bound for World War I collided with another vessel in Halifax harbor. The resulting blast, known as the Halifax Explosion, was one of the most catastrophic events in Canadian history. More than 1,600 people were killed instantly, and the death toll rose by hundreds more during an ensuing snowstorm and winter. Thousands of others were injured and many were left homeless. Unaware that an explosion was imminent, a large proportion of the victims suffered serious eye injuries from flying glass and debris while watching through windows as one of the ships burned. Financial aid poured into Halifax after the disaster from different parts of Canada, as well as from Chicago and around the world, but Massachusetts — and Bostonians in particular — showed tremendous generosity. In addition to hosting memorial services and raising funds, Boston sent surgeons, doctors, nurses, and medical supplies by train to Halifax. To say thank you, the first Christmas tree was sent to Boston the following year. After waning for a while, the tradition was resurrected in 1971 and has continued ever since. An annual memorial is held on Dec. 6 in Halifax to commemorate the Halifax Explosion. Last year, Nova Scotian marathon runners ran in front of the tree as it left the city to honor the victims of the 2013 Boston Marathon bombings.